Construction on the Pepsi Center began in October of 1999 and took 6 years to complete. Pepsi Center is now one of the most popular sporting event vendors and was home to the 2001 NHL All-Star game and the 2001 Stanley cup finals. ConventionVendor.com offers in house technology rentals for the Colorado Convention Center at a fraction of the cost of buying equipment for a trade show booth. We can provide everything from lighting and speakers, to plasma televisions and video walls for your booth. We cover every aspect of the rental from delivery to set-up, making your job hassle free! The Colorado Convention Center is one of the most architecturally pleasing convention centers ever built. 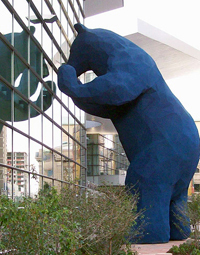 One of the most visually distinct features of The Colorado Convention Center is the giant blue bear that peers through the front windows of the convention. The Colorado Convention Center is one of the most user friendly and most practical meeting facilities ever created. The Convention was designed with the help of 100 professional meeting planners. This conference center has anything a convention organizer or attendee could possibly need in a convention center and its all in a gorgeous building right in the heart of downtown Denver. 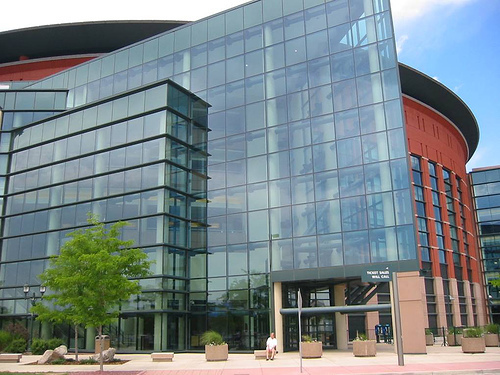 The Colorado Convention Center offers 584,000 square feet of convention space that can be split into six different halls. There are 63 meeting rooms, and a 85,000 square foot ballroom that can be divided into hundreds of possible configurations. The main highlight of the convention is the Wells Fargo Theatre that seats up to 5,000. The convention center also has a new Light Rail Train Station under the parking garage. Due to the tremendous popularity of Colorado Convention Center Computer Rentals, ConventionVendor.com does business with attendees of The Colorado Convention Center daily. Some of the most popular orders we receive include, but aren't limited to: LCD & Plasma Rentals, Desktop PC Rentals, Laptop Rentals, File Server Rentals, LCD Projector Rentals, Printer Rentals, Copier Rentals, Wireless Microphones, Amplifiers and Staging and Event Equipment. These items and more are available by the day, week, or month to help with your short term Colorado computer rental needs. ConventionVendor.com is not affiliated with or in any way authorized by Colorado Convention Center. ConventionVendor.com is an independent nationwide technology rental provider and this page in no way implies exclusivity of service to The Colorado Convention Center.